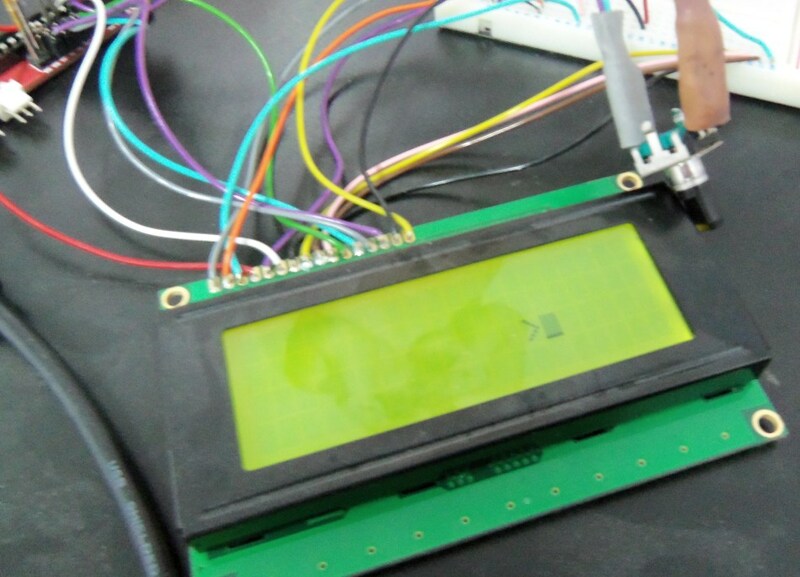 Having seen the PanelMax LCD and Encoder for RAMPS, I wanted to get a similar setup working on Sanguinololu. the first step was to get an ATmega 1284P working and load Marlin firmware which supports this sort of setup with minimal changes. Adds up to 9, just enough! I connected the circuit up (quickly, I was impatient!) as shown in the Schematic. Note that the connection marked SCL on the Sanguinololu expansion header is plugged onto by the SDSL plug, but not used by the SDSL, I have connected onto this pin where it comes out of the plug as it is needed for the push switch in the encoder. The two variable resistors as 5K as that is what I had to hand, the one for the LCD brightness (R1) is set to around 1K, the one for the LCD contrast (R2) is set to around 4.5K Ohms. 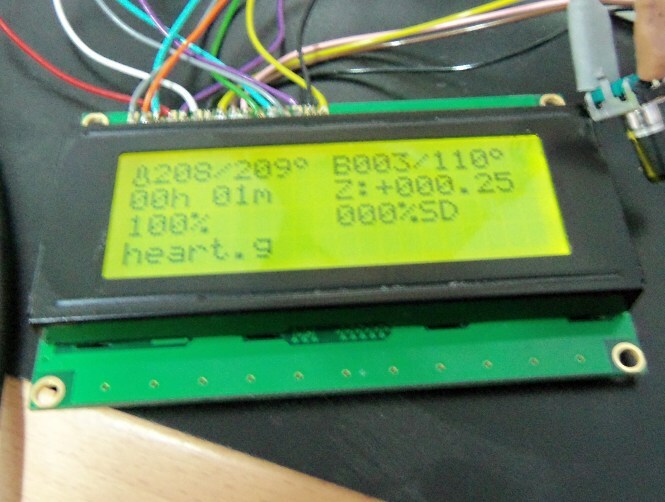 So first step accomplished: the Sanguinololu talking to an LCD Screen. Next I messed around with some of the examples shown on the Arduino rotary encoder page and ended up with a bit of a hybrid one that allows you to move the cursor around the screen with the encoder, with an arrow to show which way its going. Clicking the switch on the encoder resets it to the middle. The code is available here (EncTest.pde), if you want to have a play with it. The pseudo print continued without issues. The next step will be to tidy up the wiring and get it connected up to a live printer! GLad to see this work going on. Let me know when you have an LCD working Sanguinololu and I"ll probably order it. Do you know if Marlin will work with Sanguinololu 1.1? That is what I have. I just ordered a 1284p from you guys in anticipation. I don't have a Sanguinololu 1.1 but Marlin should work. 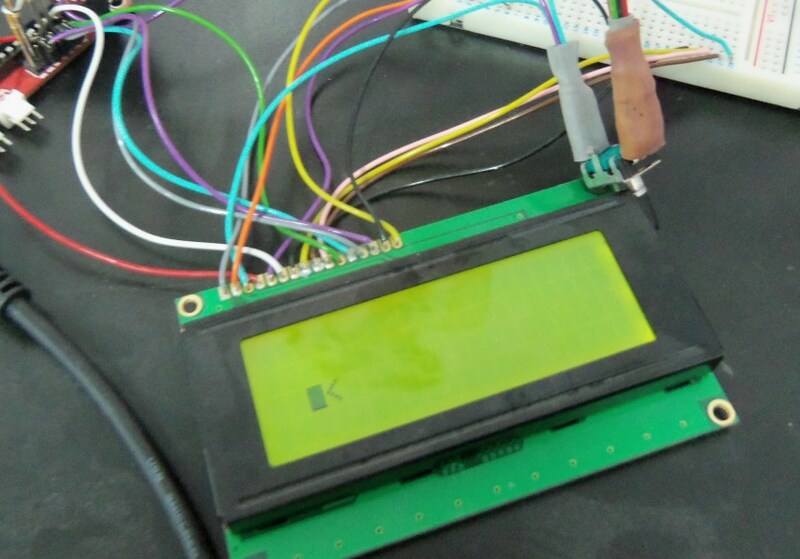 As for the LCD screen + click encoder, that will also work however the 1.1 has a slightly different expansion header. the different header will mean wiring the connector we intend supplying with our kits in a slightly different way. I have just finished the same project (Sanguinololu 1284P with Marlin 1) but I ended up using Lady Ada's LCD BackPack ( http://www.adafruit.com/products/292 )to save and extra 3 pins (for the fan and buzzer). With time you could actually run the LCD on the same SPI interface as the SD and save 6 pins but I run out of patience. I also could not find the solution you got to with avrdude config file, so I went brute force and changed the resonator for a crystal and corresponding caps. I also found out that the D12 (PWM) pin on the header (as you can see in the picture and in the board)is actually connected to D4. 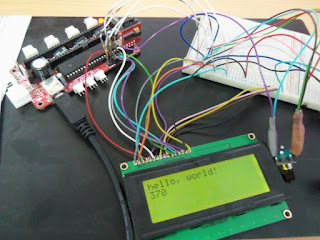 Yeah I have been paying with I2C extensions for some time but nothing solid yet. 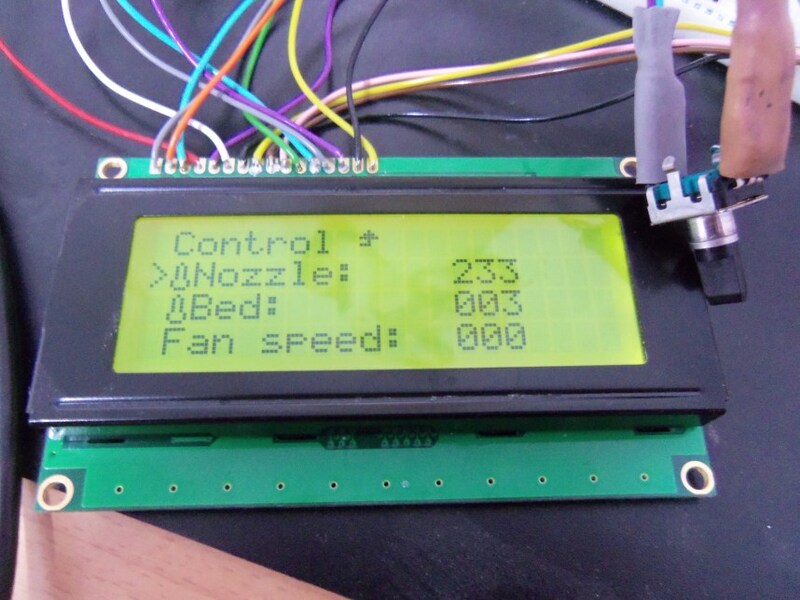 I did not want to use an LCD backpack (played around with this one from hobbytronics http://www.hobbytronics.co.uk/i2clcd-backpack) because I felt (at the time) that if I went to I2C I wanted to have everything (click encoder, LCD, fans, buzzer etc) on the I2C bus so it was easily portable to RAMPS, Gen 7 etc. 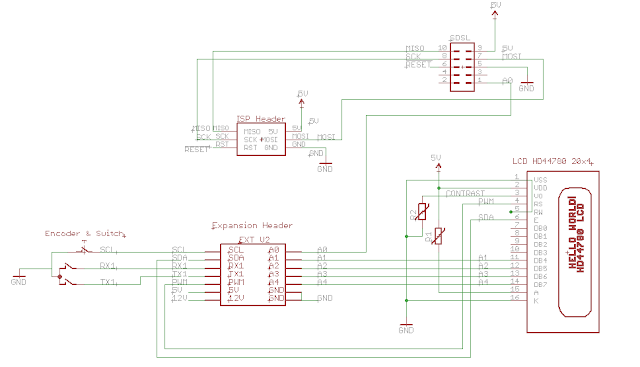 After pouring a huge amount of time into developing an atmega328p based I2C extender I got frustrated with integration at a software level. I want to offload the UI to the 328P and use GCode to send commands to the main board - its a project on the back burner right now but I am interested in a common, open, bus - based, extension to reprap electronics that would allow me to add bits to a standard board cheaply. 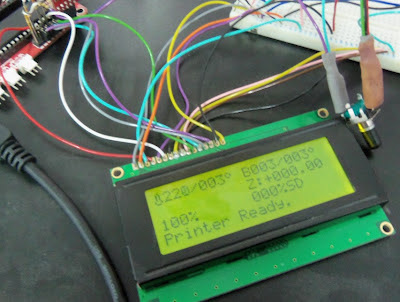 That way when we all change to something like a Smoothieboard (http://smoothieware.org/smoothieboard) or start printing with 3 or more colours then the upgrade path should be easy. As far as the D4/D12 pin is concerned its labelling error on the board, I relied heavily on the Sanguinololu schematic which is labelled correctly. I have also encountered problems getting the fan to work on pin D29. It stops all Z movement when it goes high. By the way thank you very much for posting your implementation. It is really helpful, well presented and would have saved me days of trials getting the boards to communicate. The way I describe above uses all the free pins from the ATmega. Bluemetal's method (in previous comments) using an 12C LCD backpack leaves you with more free pins - enough to have a fan and a few spares. Thanks a lot!!! I spent many hours to understand compile problem. And now with your description its compiled well!!! I was able to run a fan with this setup by modifying the board so that there is only one enable circuit. This frees up a pin for the fan. Good work - especially a good idea if you have a delta printer and there is no advantage to being able to enable the Z axis seperately. super, it was a great help for me too. My only trouble is that the "BTN_ENC 16 //the click" is still output, not input....however it is declared as input somewhere. can a spare pin be used to control a servo? 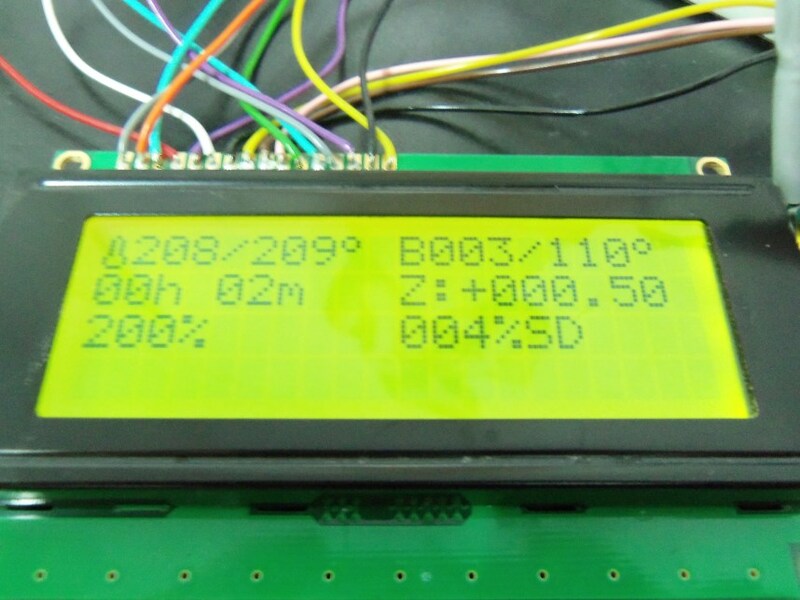 i have the a Sanguinololu 1.3a with the panelolu 2 lcd that i purchased from you and i want to use the z bed auto level function, the new marlin firmware update, any help would be great i have power to the servo from the 5v and gnd on the pin headers of the panelolu 2.
on what pins go where. Hi there, am I right in saying that this has to be compiled as Sanguino 1284p , not as Sanginololu 1.2+ because trying to compile as Sanginololu 1.2+ just kicks up nothing but errors during the compile. Yes you need to use the Sanguino extensions and have the chip setup for Sanguino 1284p. I trying to interface Reprap Full 128*64 with my 1284P/644P. I have connected the pins as per your sanguino. But its not displaying. Please tell me how can I connect.